I have nothing but fond memories from my experience at the Combine Eatery. From the outside, the restaurant gives off a very clean and polished vibe, and at first, I wondered if I had dressed appropriately. 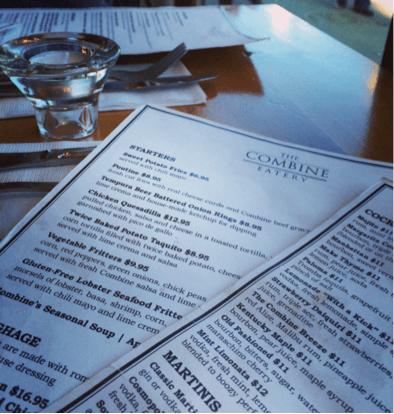 Though the inside was just as pristine, the Combine Eatery is far from pretentious. The staff were warm and inviting, allowing their guests to feel comfortable in the atmosphere. When we arrived, my mother and I were shown to our table and given food and cocktail menus. At first glance, I noticed that both menus were colourfully decorated with rips, coffee stains, and wine stains. This was a bit of a let down considering the stunning exterior of the restaurant. Being presented with menus, which were poorly cared for, raised some questions. Their cocktail menu presented their spin on classic cocktails such as Margaritas, Daiquiris, Manhattans etc. The Margarita Combine Style caught my attention immediately for one simple reason; bacon. Now, if you’re like me, then you are devout follower of the sacred religion that is bacon appreciation. I had already ordered a Mill St. Tank House before I saw it, so naturally, I tried to peer pressure my mother into ordering one. 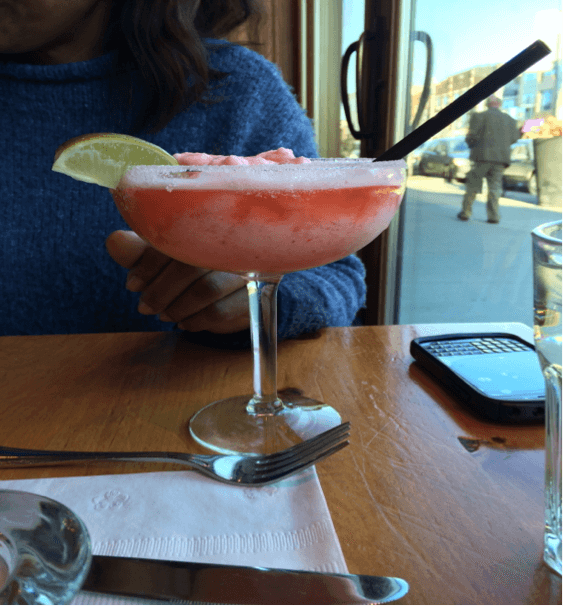 She sadly declined, and ordered the Strawberry Daiquiri instead. Blasphemy! The Margarita, $11, contains bourbon, which they have over 45 different kinds of, (yum! ), triple sec, lime juice, and a bacon bit rim. It also comes blended or on the rocks. The Daiquiri, also $11, which contains rum, triple sec, fresh strawberries, a splash of lime and grenadine, was very refreshing and flavourful. It can be dangerous as it was so delicious. A few of those, and I can guarantee that you’ll start to think that everything around you is hilarious. 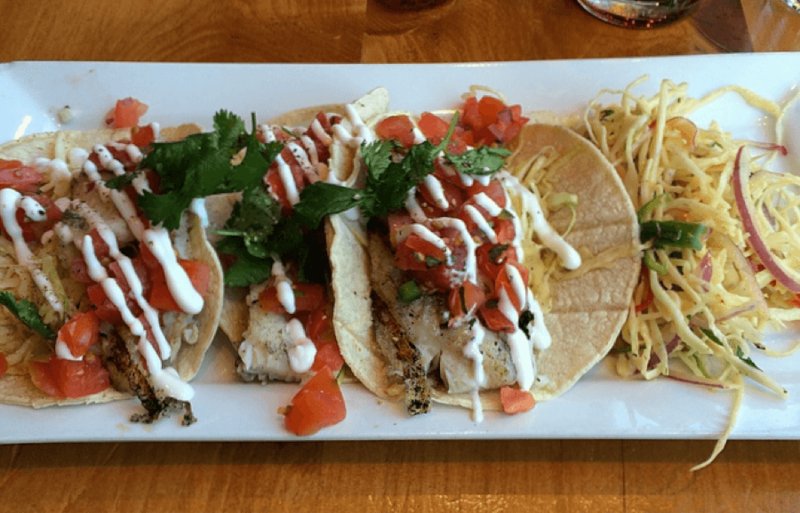 For our main courses, we ordered the fish tacos, priced at $15.95, with grilled basa fish and coleslaw, and the Southern fried chicken sandwich, priced at $18.95. At this point, I decided to use my cunning industry tactics and ask our server about the ingredients in the coleslaw (if you want to know what really grinds my gears, it’s a server who doesn’t know about what they’re serving). Thankfully, she passed with flying colours. She described the ingredients to perfection. Touché, server. Though she may have won this battle, the war was far from over. The fish tacos were served in a white corn tortilla with diced tomatoes, basa fish, coleslaw, pico de gallo, lime crema, Monterey Jack cheese and fresh black pepper, if requested. It was great, but personally, I would have like to add an extra flavor kick to it. A side of grilled lime would have worked perfectly with the cilantro, and the acid would have brightened it with a smoky flavor. 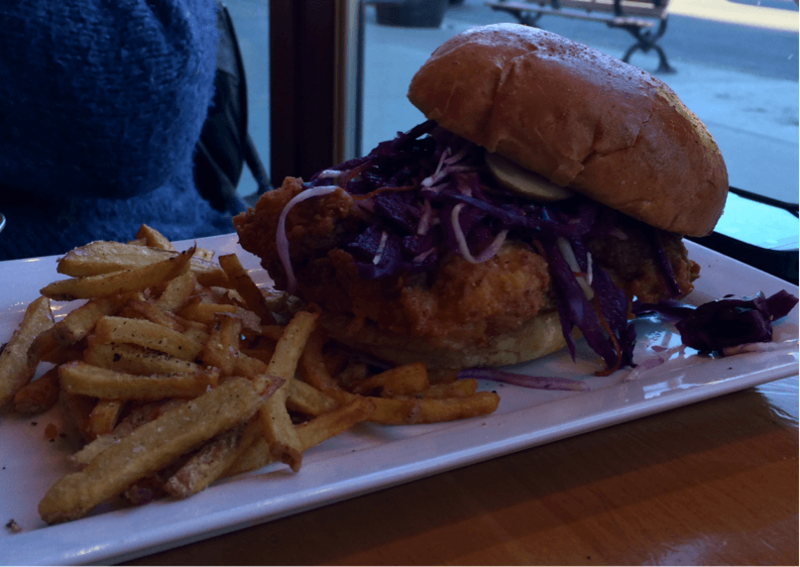 The chicken sandwich was served on an egg bun with a rainbow slaw, dill pickles, chili mayo and a side order of fries. I’m happy to say that the sandwich was excellent, each bite tasting better than the last. The chicken was hand breaded, seasoned, and cooked to perfection. The side order of ketchup was made from scratch, to which I quietly rejoiced. Finally, we came to the most important dish of the night; the dessert. We sinfully indulged on the New Orleans style beignets with house made vanilla ice cream, blueberry compote, and whipped cream (excuse me as I wipe the tears from my face from remembering how delicious it was). The presentation was beautiful. 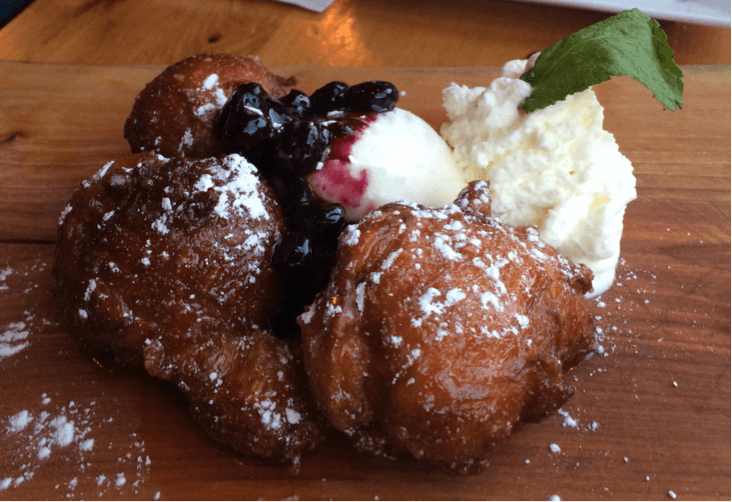 The beignets themselves, delicately sweetened with maple syrup, were not overly sweet, and the compote added just enough acidity to cut to the richness of the ice cream and beignets. I definitely needed a moment of silence after we finished it, if only to reflect upon what had happened during our final course. My gold star of the night would go to the manager, Amy. Funny and extremely accommodating, Amy commended me on treating my mother to dinner that evening, a tactic that I found to be either flattering or a very clever method of making fun of me. I’ll let her have that one, because let’s be real, I haven’t had a social life since high school. As we were leaving, Amy informed me of a charity fundraiser that the restaurant will be participating in on April 23, 2014. TD Canada Trust and Fife House are sponsoring this event to raise money providing homes for men, women and families living with HIV/AIDS in Toronto. The restaurant will be donating 25% of their earnings that day towards the cause. I find it genuine and profound to see a business go out of its way to do such a thing for a struggling community, and I will definitely be spreading the word about this event. 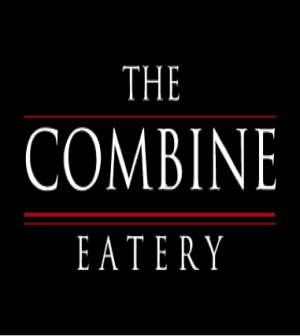 A big thank you to the managers, Amy and Adam, for their hospitality at the Combine Eatery and for providing my mother and I with such a great experience. In my book, this restaurant gets two thumbs way up in the air and three snaps in a ‘Z’ formation. I’ll be going back again soon. Julian Mignott has been working in Toronto in the food and beverage industry for almost 10 years. He attended George Brown Chef School at the age of 18 and had the opportunity to further his culinary knowledge in the south of France at the age of 20. He is now currently attending Ryerson University completing a Journalism program as well as doing some freelance writing. Follow him on instagram: @juelz_mignott.